at any other website. Sale prices excluded. to best quality from long-established, well-respected manufacturers. 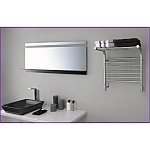 Also for your perfect bathroom, see our popular Towel Warmers! Our Skin Care Selection includes 100% all-natural and almost-all-natural products. No Stardards: Incredibly, there are no established standards for specifying the magnification srength of makeup mirrors. The magnification powers you see listed here, and for that matter everywhere else, are determined solely at the manufacturer's discretion. For that reason it becomes critical to only purchase from trusted and well-known manufacturers that take pride in the quality of their product. • Distortion: Since concave glass is used, no magnifying mirror can be completely distortion-free. To bring about greater magnification, the glass must have a greater concavity. The greater the magnification the greater the concavity and the greater the concavity, the greater the distortion in the image. But all is not lost. The area of least distortion is at the dead center of the mirror. The further from the center, the greater the distortion. The larger the mirror, the lager the center. It then follows that the larger the center, the larger the area of least distortion. This translates to advice to get the largest mirror for which you have room. • Too Close? Another consideration is focal length. In other words how far - or how close - must you be to the mirror to get a good, in-focus image? The greater the magnification power, the closer you must be to get a sharply focused reflection. 5x and 7x mirrors are the most popular because the magnification power is comfortable for most people and the viewing distance feels normal. Going up to 8x, 10x, and 15x requires that you become increasingly close to the face of the mirror to get an in-focus image. For the 15x mirror, you need to be as close as 2 inches! Many people find this objectionable. Of couse people with vision problems find the greater magnification beneficial and don't object to being very close to the mirror for good viewing. Backing: What material is used to coat the rear of the glass in order to make it reflect? It can be aluminum or silver. Silver yields a brighter, more crisp reflected image. Our mirrors use silver, exclusively. The Frame: The quality of the frame is important for durability and for one other reason. 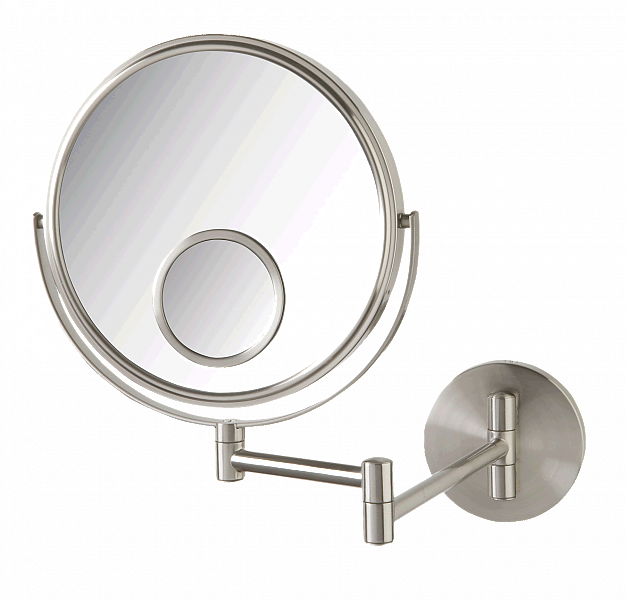 Makeup mirrors are usually, or at least often, used in bathrooms which can get steamy. High quality frames are heavily plated or plated in multiple layers such that they don't rust, even if they were to be used in steam rooms. Smoothness of operation is an attribute of high quality frames - and when you adjust the makeup mirror to a certain angle, it says put - even after decades of use.